When Explore Fairbanks launched their new website on December 15, 2016, 12 local business native advertising programs went live with it via Destination Travel Network. As the months went by, participation grew. Today the site has 25 local businesses engaged in the website’s DTN program. This success is thanks in large part to thorough planning between DTN and Explore Fairbanks. So we reached out to Kasey Gillam, Explore Fairbanks Assistant Director of Communications, to find out how they helped execute a textbook DTN launch. The Fairbanks Visitors Bureau took great care to meet the needs of those they serve when looking to build their new website. This included creating a task force, consisting of a group of Explore Fairbanks partners and community website and tourism industry professionals. Not only did the website task force provide insights for development, Kasey learned they were interested in advertising opportunities. And with the diversity of companies that make up the partnership, she knew the program had to be affordable for the smallest bed and breakfast and meaningful for the largest brands. “The businesses we support have to want to participate or there is no reason to add the program. I discovered our partners were hungry for the opportunity. Our next consideration was the cost. 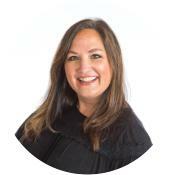 DTN worked with us to fit our needs with their program in both ad placements and price,” she said. 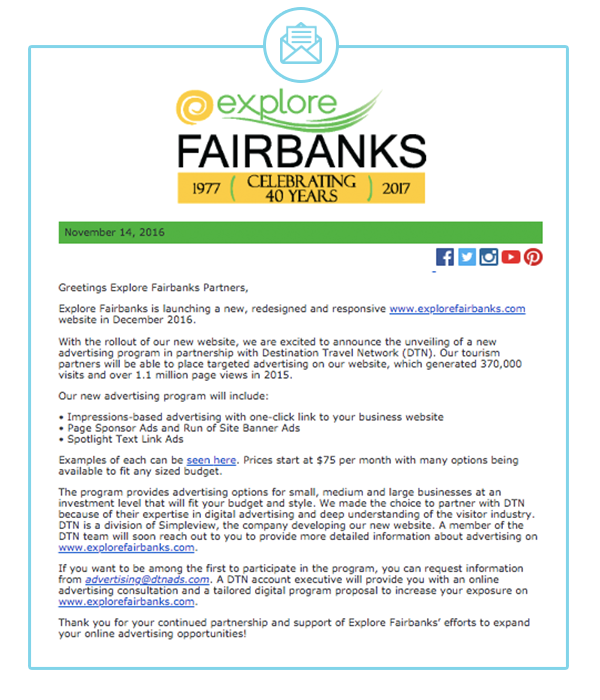 Explore Fairbanks officially joined Destination Travel Network as a publisher on January 28, 2016. While the site was being built by Simpleview, Inc. (DTN’s parent company), the DTN team was coordinating with Kasey and her team to develop the perfect program with a targeted sale-start date two weeks prior to the launch. The DTN program placements were blended in seamlessly with the rest of the website design elements. Kasey worked closely with Paul Franke, Jr., DTN Senior Director of Revenue Generation, to make sure that the placements chosen for their program only enhanced the overall design. Vicki Doyle, DTN Markets Manager, teed up the Explore Fairbanks staff for sales efforts. She provided a Media Kit, pre-check list, fast facts and communication templates Kasey and her team could use to educate their partners about the new premium sponsored content program powered by DTN. Kasey also knew her partners would turn to them first looking for information on the programs offered through their Explore Fairbanks business partnership, including the DTN opportunities. She made sure key staff could answer basic questions and run through placement options so they could give some assistance to their partners before they were passed over to DTN. “It’s been really easy to add DTN to our website. Everyone we’ve worked with has been very responsive and helpful, and our partners say the process to get their ads designed and on the website is quick and easy,” she said. Explore Fairbanks’ DTN program is in its second year and is still going strong. Kasey pointed out that very few advertisers cancel their program, and there is a mix of business types and sizes. “When you look at the partners who are advertising, some are big and some are very small. The program is doing what we hoped it would and it’s fantastic,” she concluded.